I've heard it all before from Richard Dennis but the question is, of course, is he right? He's certainly clever at identifying the inconsistencies in arguments for neo-liberalism and highlighting them with catchy images. That both parties are influenced by neo-liberalism but neither are ideologues, so the LNP wants to sponsor coal and the Greens will use a market mechanism for carbon reduction, and Labor already has. Or the LNP will attack regulation for business but happily regulates unions and the unemployed. Or that Rudd's $900 GFC-era cheques were denied to just one group, the unemployed (that was on I didn't know). So the market-is-always-right thinking is dead but to call them ideologues was always to "flatter them unfairly" anyway. One thing I hadn't heard was his answer to Ebony Bennett's question on climate change: first up, stop doing bad stuff and measure. But I've many times heard the "we're lucky: we can do anything but we're trained that we can't" because "we are the wealthiest nation at the wealthiest time in our history". We just need to consider what we want and our priorities. He gave a lovely story of the deco baths at his boyhood home of Newcastle, built beautiful and for free and wide use by the community, when, during the depression, when we were our poorest. Essentially he was arguing for a public conversation on "which public policies spark joy" in place of the endless TINA (Thatcher's There Is No Alternative) thinking. And to be aware of numbers, like spending "$50b for 12 subs to replace 6 we never used" (another good line!) and how defence is never presented as a problem for the budget (yes, and fully indexed, unlike the rest of government). Or that the cost of some generosity with the unemployed would be a "rounding error" in the budget (Comm budget $2t, forecasting error is $5-10b, Newstart increase is $2b). And to be careful with unquestioned ideas, as in "we need to minimise costs so we can compete" and yet Volvos are imported into China. Then some questions. Water as a disgraceful and corrupt scheme, and how Howard promised $10b to "save the Murray" without even consideration of Cabinet. About GDP, that the discussion should be much wider: on what we want, not just a one holied figure to rule them all with the assumption of trickle down. Then spreading the word; influences of behaviourism vs economics; inequality and the bigger gap between rich and poor as a greater incentive for the poor (while highly paid people are incentivised by higher salaries), or how work gives dignity despite many of the truly wealthy never having worked a day in their lives. How "neo-liberalism tells confusing stories", as in "inequality not as a problem but as part of the solution". What follows the downfall of neo-liberalism? RD suggests "democratic engagement" rather than another ideology. Neo-liberalism gave us TINA, which offers trivial choices to individuals but denies society-wide choices. It must be the run up to the election, but I was amused when he said "I'm sounding very optimistic at the moment; apologies for that". His reason was that we now have some alternatives to vote for, after Barnaby and Tony and others "took the party right out into LaLa land". Yep, I'd heard and read a good deal of this before from Richard, gathered some factoids that are worthy of consideration as are a string of inconsistencies in argument. Is he right, not just persuasive? I think so but it's more significant what Australia thinks and we'll know that pretty soon. 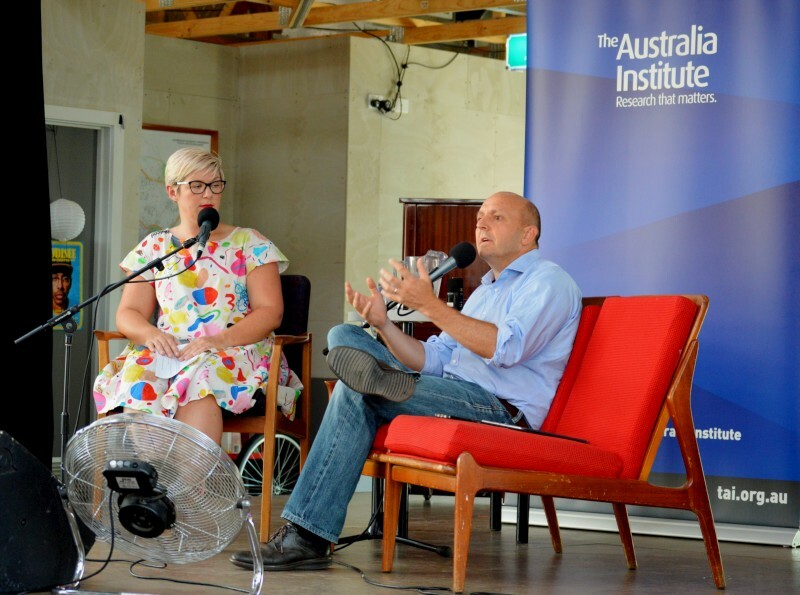 Richard Denniss was interviewed by Ebony Bennett (both of the Australia Institute) at the ANU PopUp for a Politics in the Pub as a preview of his upcoming book Dead Right : How neoliberalism ate itself and what happens next.